It’s a place on South Street you’ve probably walked by hundreds of times. Maybe you even stopped and stared through the gates. Perhaps even went inside once or twice. 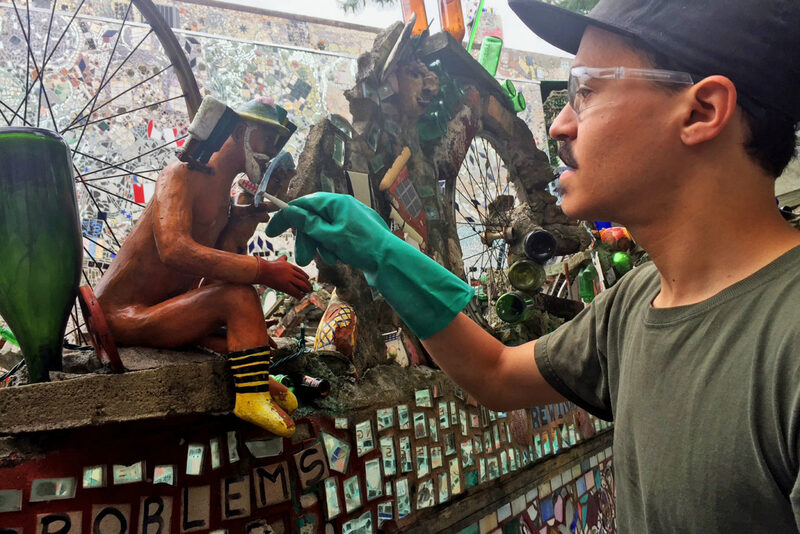 The Philadelphia Magic Gardens at 1020 South Street sparkles in near pristine glory under the summer sun, bits of broken glass and tile capturing the light and sending it back out in waves of color. Inside, the magic continues, as a labyrinth of objects – bike tires, folk art from around the world, concrete, iron – winds across a multi-level arts palace that is open to everyone to explore. But even as the Gardens work their obvious magic on visitors and the surrounding neighborhood, there are other forces at work, wearing away at the sheen of the mosaics, the structure of the walls. Like all gardens, much of the museum ‘grows’ outdoors, exposed to the harsh Philadelphia extremes of weather. As the temperature spikes from cold to hot, hot to cold, concrete cracks, tiles are worn down, and worst of all, much of the folk art, made of natural materials like wood, begins to disappear. It’s the work of Stacey Holder, the Preservation & Facilities Manager at the Magic Gardens, and her team to ensure that the magic of the museum lasts, not only for today’s visitors, but for future generations of curious explorers. It’s work that leads Stacey and her team on a series of adventures around the city. They’re always seeking out new workshops and training sessions, to learn how to work with and repair the range of materials that comprise the mosaics. Most recently, they’ve even begun to expand this work beyond the limits of the Gardens themselves. Two years ago, they launched a massive project to find and document all of Isaiah’s mosaics. So far, they’ve completed their survey of South Philadelphia. Over 200 mosaics exist in that area alone, some of them clearly visible to the public on exterior walls, others hidden in backyards and patios. When Robinson first began working at the school, he discovered that the mosaic had been covered in drywall. He quickly unearthed it, in the belief that the piece was a part of the school’s history. After striking up a friendship with Zagar, whose new studio is near the high school at 10th and Watkins Streets, the artist agreed to visit the school and talk to the students about his work. Robinson most remembers Zagar’s generosity on working with neighbors to create new mosaics to benefit the community, and his honesty to the students in conveying that creative work isn’t always about making money. In fact, for Zagar most of the work emerged as the result of a series of intense struggles. They began in 1968, when Zagar and his wife Julia moved to Philadelphia after a stint in Peru with the Peace Corps. They returned to a turbulent atmosphere, both on a local and national level. At the time, the neighborhood they chose, South Street, was a place where property could be found for low prices. There wasn’t much of a community there, and the city had plans to demolish the run-down neighborhood in favor of a highway connecting I-95 and 76. But Isaiah wasn’t the only artist who had envisioned the possibilities that could emerge from affordable property prices, to transform the South Street corridor into more than just a place to live and work, but into a burgeoning community where creative Philadelphians could come to share their work with others. As more and more storefronts and studios opened up in the area, the artists took it upon themselves to fight and fight hard to preserve the new community. And they won. In the midst of his local battle to save a neighborhood, Isaiah found himself preoccupied with even larger concerns. Namely, the Vietnam War and its effects on the country. Already a painter and graphic artist, Isaiah turned to the form of distraction he knew best: working with his hands, this time to create mosaics. The fortuitous availability of affordable real estate in the neighborhood meant that he could take this exploration even further, reshaping the local world around him into something of beauty. Today, the Gardens sprawl across what was once four properties. There was Isaiah’s studio in the back (once an automotive repair shop), a row-home out front, and two vacant lots next door. The lots were once in danger of being destroyed, when the original owner decided it was time to demolish the properties. But the community fought back. The Philadelphia Magic Gardens became an official non-profit in 2008. Now, one of its most important missions, outside of preserving the work, is figuring out how to honor Zagar’s aesthetic for years to come, when he is no longer directly involved in its creation. They also wish to expand preservation work beyond the museum itself. For now, that involves the immediate surrounding area, as the staff has begun sending letters requesting permission to perform minor repairs on other Zagar mosaics within a five block radius. As for Zagar, his work is mainly focused on the new studio on 10th Street, a 9,000 square foot warehouse. Few museums may be as aptly named as the Magic Gardens. When you delve into the story of how it came to be, and even more incredibly, how it still continues to grow, “magic” doesn’t sound too far from the truth.